If critics most often summon the specter of criminality to dehumanize immigrants, the specter they’re likely to call upon second is disease. 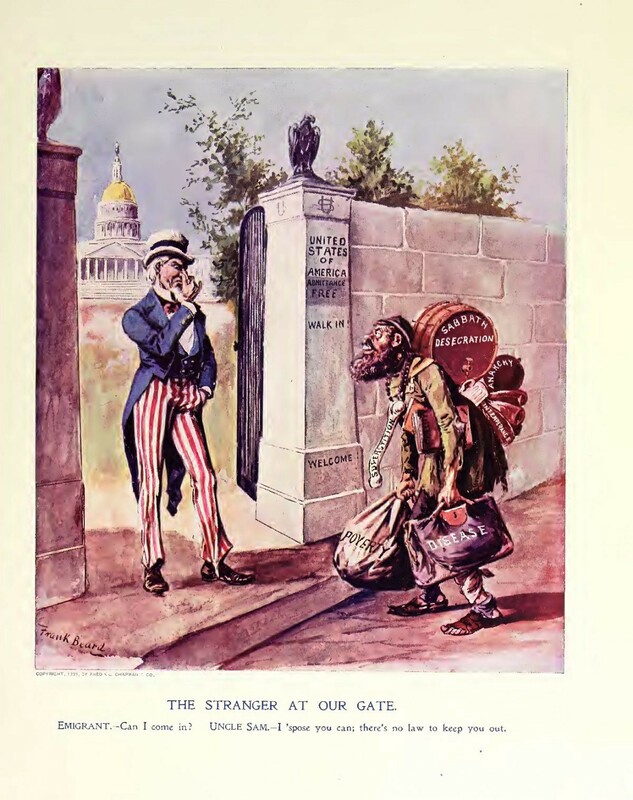 It’s a grotesque tradition that reaches back to the early years of our nation’s history. 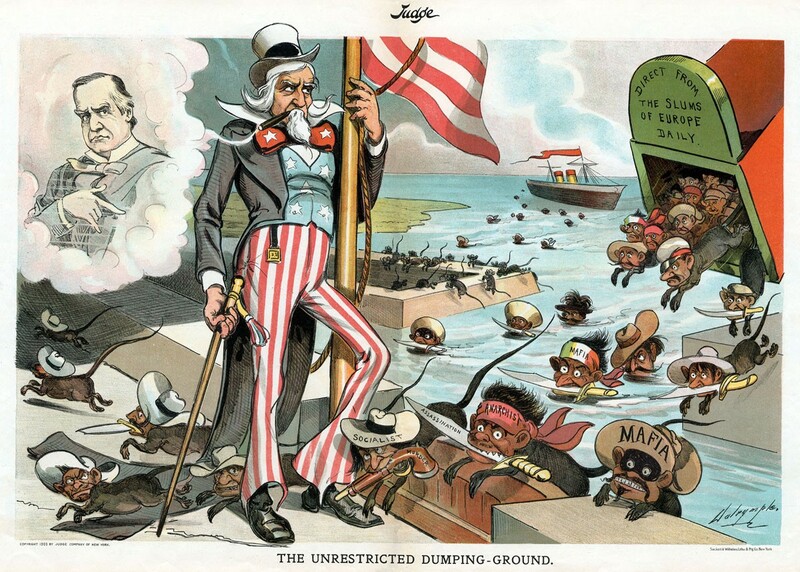 The Chinese Exclusion Act of 1882, for example, was steeped in fears about Chinese workers bringing disease to the United States. 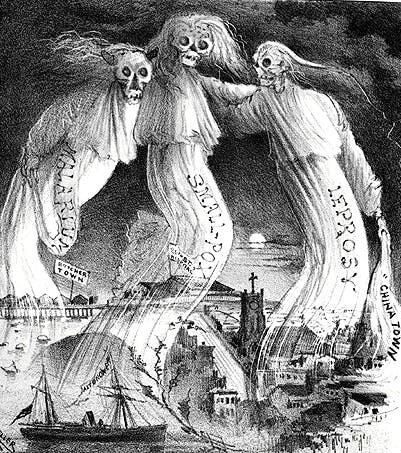 A cartoon published that year in the Wasp, a popular West Coast magazine, captured the sentiment in the form of three horrifying ghosts looming over San Francisco and bearing the names Malarium, Small-Pox, and Leprosy. I unhesitatingly declare my belief that this cause is the presence in our midst of 30,000… unscrupulous, lying and treacherous Chinamen, who have disregarded our sanitary laws, concealed and are concealing their cases of small-pox. In 1900, authorities even quarantined and surrounded Chinatown with barbed wire, declaring an outbreak of the bubonic plague after the body of a single Chinese laborer was found. 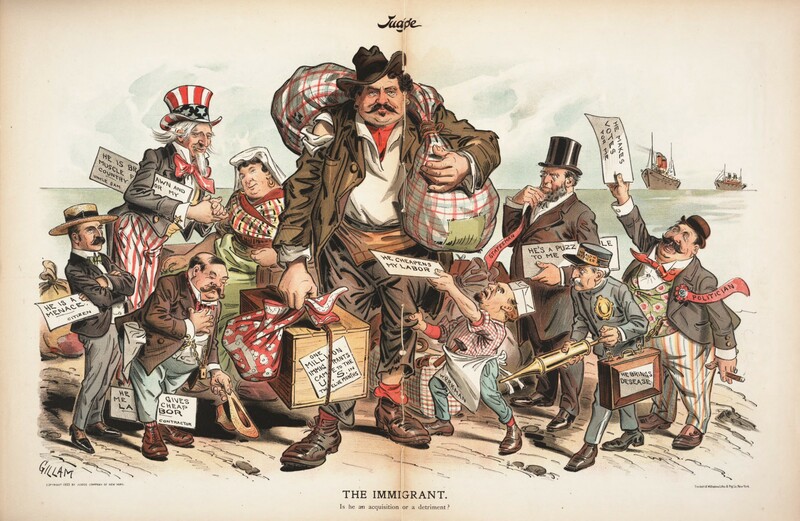 Modern cartoonists still deploy these awful characterizations of immigrants. 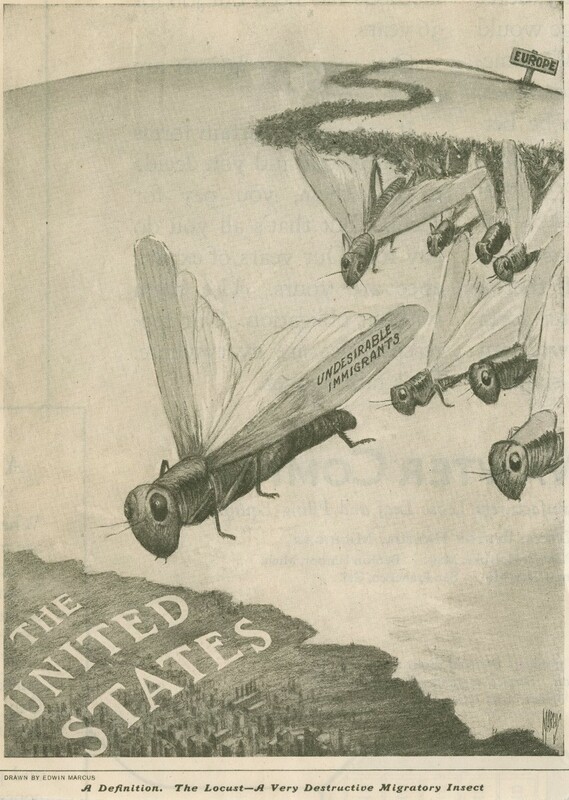 It’s also wasn’t unusual for immigrants to be depicted as pests that may carry disease, such as the rats in the 1903 cartoon below or the swarm of grasshoppers in the 1923 cartoon beside it. Modern cartoonists still deploy these awful characterizations of immigrants. Here, cartoonist Rick McKee gives Donald Trump a leg up by depicting two immigrants hoisting themselves over a fence with a line of admittedly cute and colorful diseases hoping to tag along. Whenever diseases do encroach upon our shores, pundits try to insert immigrants into the narrative. Remember back in 2014 when we were terrified by Ebola? Remember how Chris Christie’s New Jersey forced an asymptomatic nurse who tested negative for the virus into quarantine for three days because she’d worked with Ebola patients in West Africa? 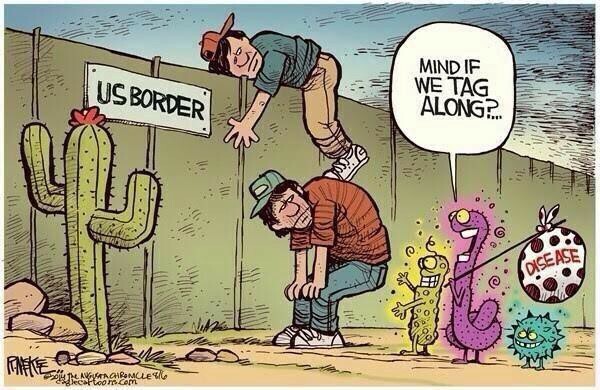 At the time, you didn’t have to look far to find folks attempting to hitch Ebola to the immigrant community. Although there were zero reports of Ebola entering the country through our southern border, right-wing Republicans tried to portray Latin American immigrants as carriers of the disease. As a candidate for a U.S. Senate seat in New Hampshire, Scott Brown expressed fears—devoid of any evidence—that undocumented immigrants were bringing Ebola into the country. Sen. Thom Tillis, then campaigning for his North Carolina seat, suggested we should shut down our southern border completely to keep the Ebola menace at bay. Sen. Rand Paul of Kentucky expressed similar concerns. 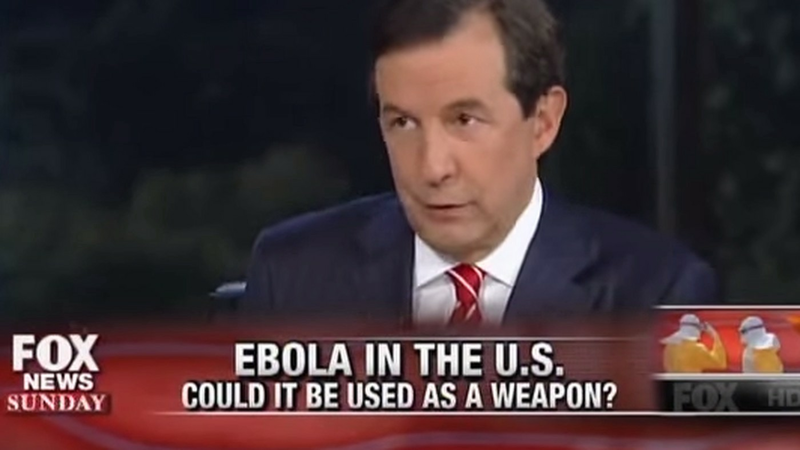 Fox News anchor Chris Wallace even coughed up a scenario where an Ebola-infected terrorist might launch a biological terror attack after crossing our border with Mexico. Oddly enough, none of these Republicans suggested sealing off our border with Canada. Presented with the possibility of Ebola flooding our Mexican border, Dr. Thomas Frieden, then-director of the Centers for Disease Control and Prevention, was unequivocal: “That is not happening,” he said. Then there was Zika. In 2015-16, a Zika epidemic spread across the Americas. Our government arguably failed both to prepare us for the outbreak and to educate us about how Zika is transmitted. In the absence of a strong public health response, conservative blogger Michelle Malkin hashed out a diatribe that saddled fears of Zika to her favorite target: undocumented immigrants. Given that the U.S. population nears 330 million, is 50 sick people approaching our border on any given day truly a crisis? In an article published in the Journal of Risk Research, researchers from Yale and the University of Pennsylvania mention Malkin’s piece as an example of those “seeking to leverage public anxiety over Zika into greater attention to their special cause.” A report from the Migration Policy Institute concluded that, given the 40 million annual American travelers to places affected by Zika, U.S. citizens were far more likely to spread the disease than immigrants. Of course, there’s no trove of data to support Trump’s assertion that undocumented immigrants are spreading “large scale crime and disease.” Nonetheless, his army of true believers latch onto these falsehoods and spread the misinformation… like a virus. This may sound like reasonable cause for concern, but given that the U.S. population nears 330 million, is 50 sick people approaching our border on any given day truly a crisis? A greater number probably present themselves with an illness at your corner clinic every day. We’ve also seen the various migrant caravans provoke fear, animosity, and misinformation. Last year, Fox News trumpeted a report from Tijuana that more than a third of the 6,000 migrants in the caravan was being treated for health issues. In addition to noting that more than 60% had respiratory infections, the network zeroed in on three “confirmed cases” of tuberculosis, four cases of HIV/AIDS, four cases of chickenpox, and 101 cases of lice. Disease shouldn’t be blamed on any particular group, especially not those already impoverished and disadvantaged. Following the report, Mexican officials clarified that there were no cases of TB. And even if there had been, the disease is preventable and curable with proper treatment. Chickenpox is also preventable (and being spread much more widely by anti-vaxxers already in the United States). As for the four cases of HIV/AIDS, as a percentage of 6,000 migrants, it’s a minuscule number (0.067% to be exact). Though the disease has long been weaponized to strike terror among our citizenry, it’s also preventable and manageable today. Lice is another entirely treatable condition common in crowded living conditions and hardly unique to migrants. Disease can affect any human being. It can be inflamed by poverty, travail, or certain living conditions. It shouldn’t be blamed on any particular group, especially not those already impoverished and disadvantaged. Subsequent references to the Fox News story exaggerated the already sketchy reporting, claiming that one-third of the migrants suffered from HIV, tuberculosis, or chickenpox. Snopes rated these claims “mostly false,” highlighting what should be obvious to any curious observer. The Associated Press took a more nuanced approach to the same story, focusing on the unsanitary living conditions at the Tijuana shelter that contributed to the spread of illness. The more detailed AP report also noted that many migrants were suffering from dehydration and that their feet were damaged and blistered after walking hundreds of miles. Perhaps it’s no surprise that Fox News didn’t highlight these facts. After all, doing that would have cast these migrants in a much more sympathetic light. The fixation on disease among immigrants means some detainees being treated for scabies and a single case of chickenpox at an ICE facility last year apparently warranted press coverage. Never mind the fact that anti-vaxxer Americans have triggered their own outbreaks of the measles and chickenpox in places like Kentucky, North Carolina, and New York. The problem becomes when individuals who are already nativistic in their inclinations use disease as a metaphor to describe others because of who they are, not because of health conditions. It seems to lend itself to a scientific justification, but that couldn’t be farther from the truth. 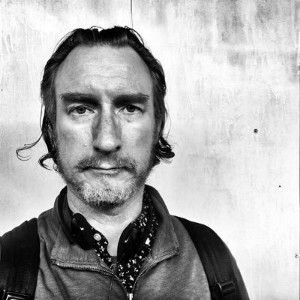 It’s the use of language to stigmatize people you already want to shun for another reason. According to a landmark report on migration and health published late last year in the Lancet, migrants in high-income countries like the United States “are more likely to bolster services by providing medical care, teaching children, caring for older people, and supporting understaffed services.” In other words, they’re more likely to be fighting diseases, not spreading them. When diseases do flourish in migrant populations, it’s often due to poor conditions in government-run refugee camps and detention facilities. In other words, our treatment of migrants can cause the spread of disease. So, next time you read a report linking immigrants to disease, recognize that someone is tapping into some of our basest beliefs again. They’re applying ugly, disproven, xenophobic stereotypes about immigrants to our fellow human beings. It still works. And so long as this tradition bears fruit, it will continue.